Do you know what a curriculum slave is? I’m sure you’ve met one before — perhaps you’ve been one before. (Or perhaps you’re one now, in which case I’ll try to help set you free in the course of this post.) A curriculum slave thinks the curriculum is her master, and she has to follow whatever the curriculum says — to the letter. The curriculum slave doesn’t allow herself to think about what is best for her students — or even for herself as a teacher. Instead, she exists at the curriculum’s beck and call, and when she doesn’t fulfill its requirements, she beats herself up. On the other hand, we have the teacher who views herself as the master — and the curriculum is only the tool. The difference becomes obvious when we watch her in action. Yes, she uses the curriculum. After all, she “hired” it to help her do a job. But she is still the one in charge. The curriculum says Monday, but she knows Tuesday is better. The curriculum says one lesson three times per week, but she is wiser still. She knows that Johnny would do best at twice that pace, while Jane would thrive on bits of lessons every day, spreading those three lessons over the course of five days. As a homeschool mom who also writes curriculum, I think I have a unique perspective. In the beginning, I hesitated to put what I shared here on the blog into a curriculum — this was supposed to be one mom sharing what she was doing with her own students. But all the emails convinced me that you all really did want the formality and direction of a curriculum. I was happy to oblige, and yet my work is still peppered with “this is optional” and “this is not a script, but rather an example” because I want so badly for you to feel empowered to use the curriculum as a tool, rather than exist as its slave. But there is more to freedom than merely feeling like you have permission. The freedom a master has comes from an intersection of knowledge and competence. The master has knowledge of the subject area, knowledge of her students, and experience over time. When I first started tutoring reading years and years ago, before I had children, I had a curriculum — and I followed it religiously. I don’t think that was entirely a bad thing because I was comparatively ignorant about teaching reading. At that point, the curriculum “knew” a lot more than me. It wasn’t so much that I was the curriculum’s slave as that I was under its instruction. The curriculum was teaching me how to teach. I needed that basic, baseline knowledge before I could get creative and improvise or change things around. Slowly, I mastered the rules of phonics, which I had only known intuitively before. I began to understand how students learn. As my confidence in this subject area grew, so did my creativity. I added a read aloud time, for example. The curriculum didn’t call for it, but I somehow intuited that children needed to understand that books were worth reading if they were going to have a desire for literacy. I had to cut the lesson length down a bit in order to make room for it. That was the first exercise of my freedom. Today, I’ve four students in four different grades in my little homeschool. It is still hard to make a call when I’m ignorant. I know, for example, that a chapter needs to be spread over three days, when I’ve read it myself. If I haven’t read it, I make all sorts of bad calls. In regard to Teaching Reading with Bob Books, then, looking at the lessons in advance will help you make a call. You can check to see what new things your child will learn that day, and then ask yourself whether it’s too much, too little, or just right. From there, you can adjust the lessons so that they fit. Or, you can keep them exactly as written because you’ve learned that the pacing is perfect … for now. The pacing is based upon an observed average and my own experience. I think it’s done well, but averages are averages. Your mileage may vary. Homeschoolers and private tutors have the luxury of being able to tailor things (like pacing) to individual children and very small groups. We have the ability to know our students intimately. We know how long a lesson Johnny can handle, or exactly what number of new ideas perfectly challenges Jane without overwhelming her. One thing you can do, if you have a particular student that is struggling, is keep a little diary on hand and start writing down your observations. The goal is to grow in your knowledge of your student so that you can make better decisions in his regard. I had one child, for example, that broke down at 10:00 am on the spot every single day without exception. When I finally figured out that all she needed was a snack to help with her low blood sugar, our day was revolutionized. 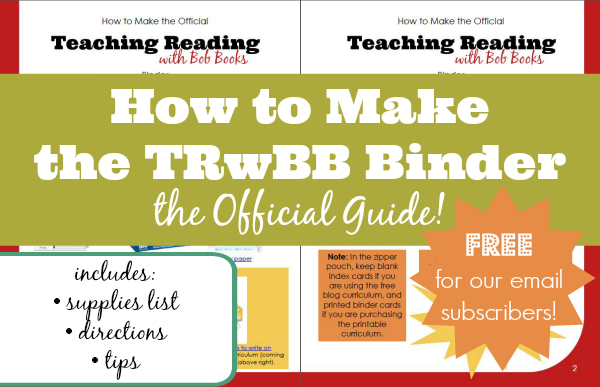 Teaching Reading with Bob Books is written for beginning readers, but beginning readers vary. A four-year-old likely shouldn’t go over 10 minutes for his daily lessons, but a seven-year-old might do fine going over the stated 15-minute maximum to about 20 minutes. If you know that your student loses all attention at minute 12, set a timer and make sure you always end right before that, regardless of whether the lesson was completed or not. Competence comes with experience, and experience comes with time, and when we say we “learned from experience,” we often mean that we learned from failure. This is where mindset comes in. You’re going to make a call, and sometimes it’s going to be a bad one. Accept that right now. If you spend time after that beating yourself up, you are not learning from your experience. Simply go to your mirror, look yourself in the eye, and agree that the call was a bad one and you’ll try something different next time. Homeschool moms are some of the most guilt-ridden, paralyzed women I’ve ever met, and this. needs. to. stop. (Learning to laugh at our mistakes might help.) This is not the freedom of a master. Study up, if it’s your lack of subject area knowledge that is causing you to doubt yourself. Pray for wisdom and ponder your child, if it’s a lack of knowledge about your student. And be confident enough to pick yourself up after you fall (you will fall) because it’s the only way to learn from your mistakes. Be patient that you don’t know it all right now. Here’s a secret: no one knows it all anyhow. But you will know more in three years, and five years, and ten years. And that’s something. So back to curriculum. It’s not supposed to be a burden that you carry, a slave-driver on your back telling you to hurry up and get those boxes checked. It’s a tool. It’s supposed to help you. So take a deep breath. Relax. Pray. And feel free to do the lessons differently from how they’re written. Because you are not a slave. And the curriculum is only your hired hand.